Welcome to another edition of our theme roundup my fellow theme addicts. I hope you all had a great weekend! Now it's time to get back to work and I have some great themes to show you in the roundup this week. Be sure to click on the jump and check them out. If you developed a theme you want to share or see featured in the contest or discovered a really great one out there by all means shoot it on over to us! Submit your tips and suggestions to themeroundup[at]crackberry.com for consideration. I hope you enjoy this week's picks so be sure to click on the jump to check them out. Simple Design has done it again and designed an absolutely gorgeous and useful minimalistic design for theme addicts everywhere to enjoy. This simple and user friendly design is not only one that will showcase your favorite wallpapers but includes hidden shortcuts, a weather slot, custom battery and signal meters, and other features that let you quickly access your most used applications. While custom themes do have the folder issue, take the plunge with this clean design that also features a hidden today area and a unique clock display. 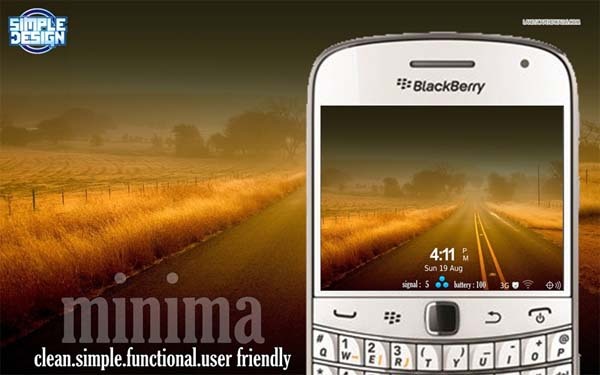 Minima is available for $1.99 for the BlackBerry 8330/50, 8520, 9220, 9300/10/20/30/50/60/70, 9650, 9700/80/90, and 9900/30 running OS 5 and higher. For all the girls out there, if you've loved the cute and adorable themes that BB Freaks have been releasing lately then be sure to check out Happy and Lovely. All of the elements are completely customized with lovely and colorful graphics to brighten up your day. With its 3D amazing icon set, purple battery meters, custom home screen, and designs that remain even if you change your wallpaper, it is an awesome theme for your compatible BlackBerry device. Happy and Lovely is a vibrant and smooth theme that is easy to use so be sure to grab it in BlackBerry App World for $1.99. It is compatible with BlackBerry 9300/30/50/60/70/80, 9650, 9700/90/90, 9800/10/50/60, and 9900/30/81 running OS 6 and higher. Browsing through our forums I came across Metro8 by Tutibreaker Designs. This replica theme gives your device a fresh look with the metro inspired icons and notifications, custom battery and signal meters, and a unique arrow focus icon. All of this gives your home screen a very professional look that looks great with all your different backgrounds. Available for FREE, Metro8 is right now available for the BlackBerry Bold 9900/30/81 and BlackBerry Curve 9350/60/70 with more devices to come. You can read more about it by clicking on the link to the forum thread below. For all the guys out there are you looking to rev up your device? Auto RPM Grey by MNG Theme takes advantage of your screen to give you a brand new look. This theme features custom icons, colors, and fonts, odometers that represent the battery and signal meters, and a redesigned home screen layout. This theme is available in red, pink, and orange but I think the darker shades of this version is nice and easy on the eyes. Auto RPM Grey is available in BlackBerry App World for $2.99. It is compatible with BlackBerry 9220, 9300/10/20/30/50/60/70/80, 9650, 9700/80/88/90, 9800/10/50/60, and 9900/30/81 running OS 6 and higher. Another one for the girls, Be Sleek Pink by Delta Themes is a smooth, stylish and functional. For non-touch screens it offers animated customizable icons (first 10 icons) on the bottom that you can scroll through to access your applications. Be Sleek Pink also features a weather slot (11th icon), a sleek looking banner, an animated medallion, custom backgrounds, and is wallpaper friendly. Pink colors and highlights flow throughout with overpowering the display. You can pick it up from BlackBerry App World for $2.99 at the link below. For the guys out there, you can grab the black version here. Be Sleek Pink is available for BlackBerry 8350i, 8520/30, 8900/10/80, 9300/30, 9500/20/30/50, 9630/50, 9700/80/88, and 9800 running OS 4.6 and higher. (This theme is not OS 7 compatible). That's it for this week folks. Hungry for more themes? 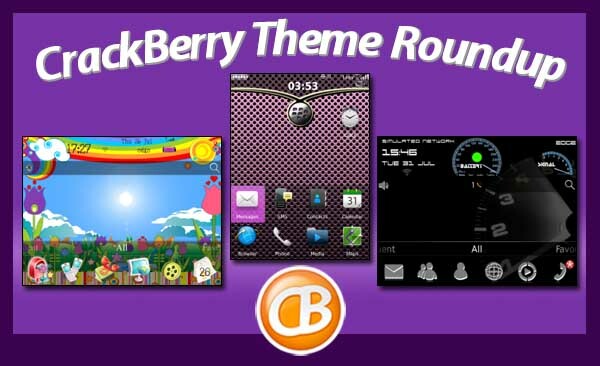 Be sure to browse the themes in our forums and those available in BlackBerry App World. See you all next week.